Butterflies teach us about persistence. In spite of being almost lighter than air they still survive wind and rain and continue to decorate our lives. It is the struggle to break out of its cocoon that gives the butterfly its strength. If you should find a butterfly in the process of breaking free and, however well meaning, you help by breaking some of the cocoon's shell away, the butterfly will be too weak to fly and will expire. It is the struggle that gives it strength. Perhaps this is a lesson for us all. 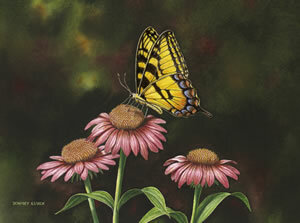 The artist, Dempsey Essick, has masterfully portrayed a beautiful Tiger Swallowtail butterfly perched on a daisy-like coneflower, which is in full bloom. The monarch will sip a small amount of nectar then move on to another blossom and then another and might possibly alight on the back of your hand. If so you can count yourself blessed. Do take time to search for the hidden hummingbird in this painting. "One of my favorite butterflies is the Tiger Swallowtail. They are probably the most recognized butterfiy in the eastern United States. Their quiet beauty is unmatched and I enjoy them in my back yard as well as when I am fly fishing on Wilson Creek in the beautiful North Carolina mountains"